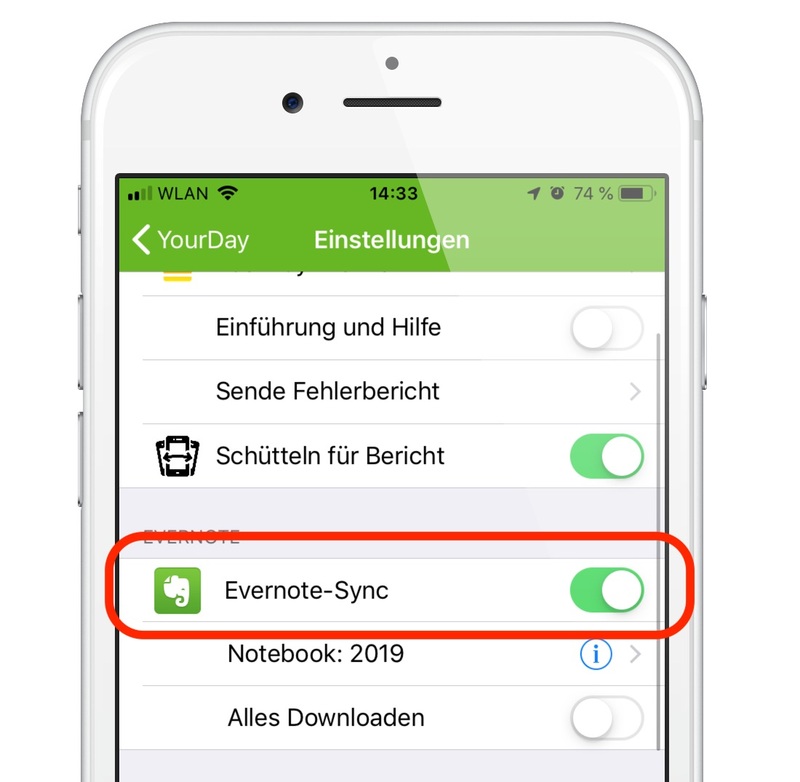 Yes, it took a while but now it’s here: the new version 1.35 of YourDay of my favorite app for creating my personal diary in Evernote. This version includes several new features, experimental features and of course a lot of bug fixes. But to be honest, some bugs from YourDay that appear in your area I couldn’t reproduce yet. I’m currently working on a new version that has a significantly improved ability to diagnose errors. I hope I can remove some of those annoying bugs. Before I get to the new features, I prefer to point out the most important error corrections. The camera icon now works correctly and you can finally take pictures directly and insert them into the journal. When entering a larger text, the text window was not scrolled any further. An error caused that journal entries with several images could not be edited. That’s now fixed. In the settings you can now choose your own notebook for your journal in Evernote. Normally YourDay saves the notes in a notebook with the title of the current year. But if you want to use another notebook, you can change it now. Unbelievable but true, so far you couldn’t delete any journal entries in YourDay. Finally this feature is working. In the detail view of a day there is now a small trashcan symbol. This allows you to delete the whole page. 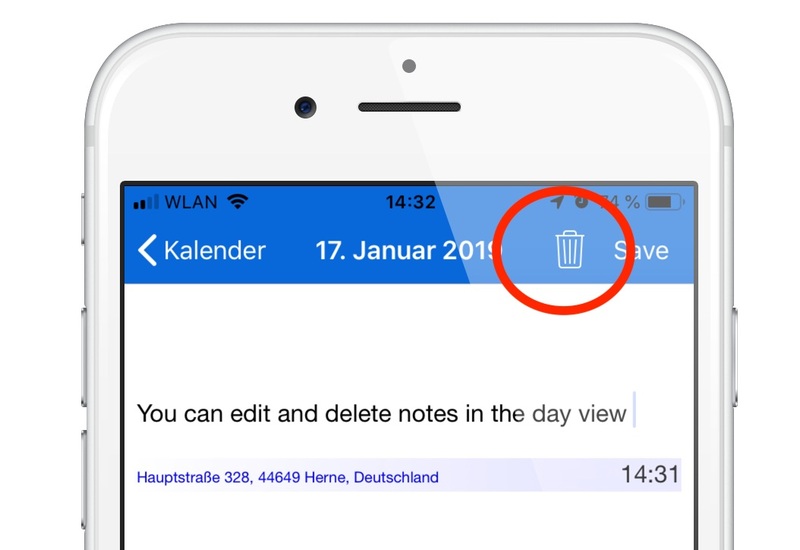 If you only want to delete one small entry of a day, you can select and delete the corresponding text. After that you should save the changes with the save button. Apple’s iPhones are getting bigger and bigger. Currently the largest iPhone is the iPhone XR. These models are so large that the Save button in the title bar becomes very cumbersome. Therefore I added a symbol (icon) to the small bar above the keyboard. So you can quickly save your journal as you type. You can now configure the notebook in Evernote where your journal is stored. Finally: You can delete a journal entry by clicking on the small trashcan icon in the day view. Explicit “Save” button to save changes in the day view. Send icon built into the keyboard toolbar to make it easier to send text on large phones. The camera icon now works correctly and you can take pictures directly. An error caused that journal entries with several images could not be edited. That’s all right now. The status of the Send button is now correctly displayed depending on whether there is storable content or not. The layout errors with the representation of the stack with the motivation question cards were fixed. Error corrected: When a motivation question was answered, the picture stopped. YourDay is an app for creating a beautiful journal or diary. YourDay is the ideal companion app for Evernote, the world best note taking app. You can create in YourDay your perfect journal and use it in conjunction with Evernote on all of your devices. (c) 2018 André Claaßen Consulting. All Rights Reserved.